Britain’s Jack Draper lost to Taiwanese top seed Tseng Chun-hsin in a gripping boys’ singles final at Wimbledon. Draper, hoping to become the first British boys’ champion since 1962, was beaten 6-1 6-7 (2-7) 6-4 by fellow 16-year-old Tseng. Watched by a packed Court One, who were vocal in support for the young Briton, Draper gave himself hope by taking the second set but was let down by a huge 42 unforced errors. Tseng sealed victory with an ace. Is Jack Draper the next star of British tennis? Previous winners of the boys’ title include 20-time Grand Slam champion Roger Federer, and while there are plenty of big names who never won a junior Slam, on this year’s form Tseng could be a player to watch in the future. A winner at this year’s junior French Open and runner-up at January’s event at the Australian Open, Tseng had not dropped a set in his previous five rounds here. After the first set it looked like it was going to be straightforward for him before Surrey-born Draper staged an impressive fightback to take the second set. 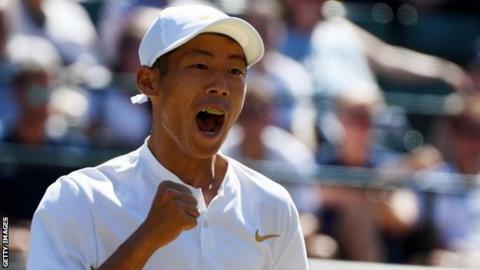 But Draper’s wayward shots, as well as flashes of temper – he had to swap racquets after smashing one into the grass – were costly against the calm Tseng. The left-hander handed match point to the Taiwanese when he missed a straightforward volley at the net, lying on the grass in disbelief, before Tseng wrapped up the title with his ninth ace of the match.